The third adventure of Joss, Hero, and Drake—prentice paladeros, or cowboy-knights, who ride dinosaurs! Joss and his Bladebound brethren have worked hard to earn their paladero training, from battling bloodthirsty witches and monsters to hunting down a gang of vicious kidnapping pyrates. 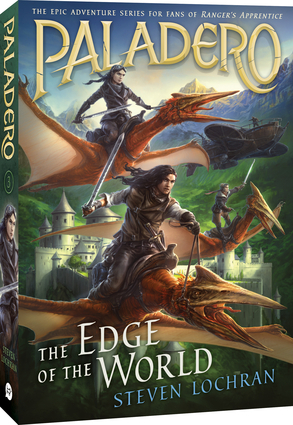 But when the three friends travel to Hero's old order, Blade's Edge Acres, to continue their training, they are faced with a new challenge: Hero's mentor, Lord Haven, is dead. And it looks like he may have been murdered. As the trio investigate Haven's death, they uncover a sinister plot that threatens all of Thunder Realm. But with dark figures circling ever closer, do the three young prentices have any chance of saving the kingdom—let alone themselves? Steven Lochran is the author of the Vanguard Prime series and the Paladero series.